All-Levels Vinyasa Yoga Flow: Build stamina and strength while moving through a series of yoga postures in a dance-like flow, encouraging your body to surrender into the stretch and become more flexible. Open to all students, beginners should take the Standing Yoga Flow class first. Bring a yoga mat and leave your problems at the door. 60 minutes. Our most popular class is offered several times a week. Standing Yoga Flow: Gain confidence in yourself as you become more stable in your body in this Standing Yoga Flow class. Linking our breath to the movement we will move in and out of yoga poses from a standing position rather than from a downward dog. Each week the class will be unique as we focus on balance, form and increasing flexibility. This class has a slower pace than the all-levels classes which makes this a great introductory class for new students. Standing Yoga Flow is great for beginners to intermediate students, if you are pregnant, have wrist issues or struggle with being in downward dog or simply want to focus more on your balance. Open to all students, including beginners. 60 minutes. Gentle Yoga + Stretch: This yoga class beats to a slower restorative rhythm, creating space within our bodies and minds by combining the breath with stretching in the fullest expression of each pose. Open to all students, including beginners. 60 minutes. Yoga Sculpt: This is an all-levels vinyasa flow yoga class but we will be using hand weights within static poses. Weight training will build muscle, increase bone density and your metabolism. Yoga Sculpt is for everyone, get a great workout whether you are a seasoned yogi or a beginner. Open to all students, including beginners. 60 minutes. Pilates Fusion: A beautiful fusion of Tai Chi, Yoga, and Pilates to improve breathing, balance and core strength. Start your day feeling longer, stronger and more centered. Open to all students, including beginners. Pregnant students should avoid this class due to the focus on the core. Bring a yoga mat and leave your problems at the door. 50 minutes. Stretch: This class focuses on poses that lengthen the muscles and exercises to increase joint mobility. Increase flexibility and reduce stiffness and/or pain. Feel lighter and move better! This class is great for injury prevention for athletes and students who would like to increase their flexibility, create balance and enhance their workout routine. Open to all students, including beginners. 50 minutes. Workshops: Offered throughout the year, please check the calendar for specific themes. 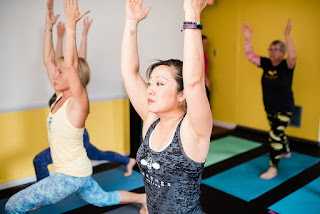 Workshops are a featured special class to delve deeper into your yoga practice or to introduce you to yoga and how it can compliment your fitness routine. Each workshop will focus on a different topic. Class passes will not be accepted. Bring a yoga mat and your thirst for knowledge. Experience Personalized Yoga and Health Coaching! Want to delve deeper into your yoga practice? Or work one-on-one with Gretchen to focus on your individual goals in your life or bring your awareness to the things that are holding you back from living your best version of life? Gretchen Schock works one-on-one with clients for a private yoga session and health/life coaching at the Bee Yoga Fusion studio. Private yoga sessions are for everyone; whether you are recovering from an injury, are pregnant, would like to have a custom workout made just for you to do at home or wanting to learn advanced yoga postures. Health Coaching sessions focus on meeting attainable goals in your life. Learning to let go of the voice of negativity and focus on bringing joy into each day by making healthier choices. Each session is customized for you. Contact Gretchen to schedule a private session or make a reservation from the open hours available under "Private Yoga & Health Coaching" when you click on the "Schedule tab". A private session also makes a great gift! Contact Gretchen if you are interested in buying this for a loved one. Signing up for classes just got easier on your mobile device! -Then touch the Share button on the menu bar at the bottom, it looks like a square with an arrow pointing up. -On the popup menu, click on the Add to Home Screen option. -"Bee Yoga Fusion LLC" will show. Click on the Add button. -You’ll return to the home screen on your iPhone or iPad, which is now showing the new Bee Yoga Fusion app icon. -Then hit the Settings button – it’s three vertical dots, locating in the top/bottom right of the screen. -Click on Add to Home screen. A pop-up window will open. -If you wish, edit the name of the page, then click on ADD. -Click OK to add Bee Yoga Fusion to your Home screen on your phone or tablet.